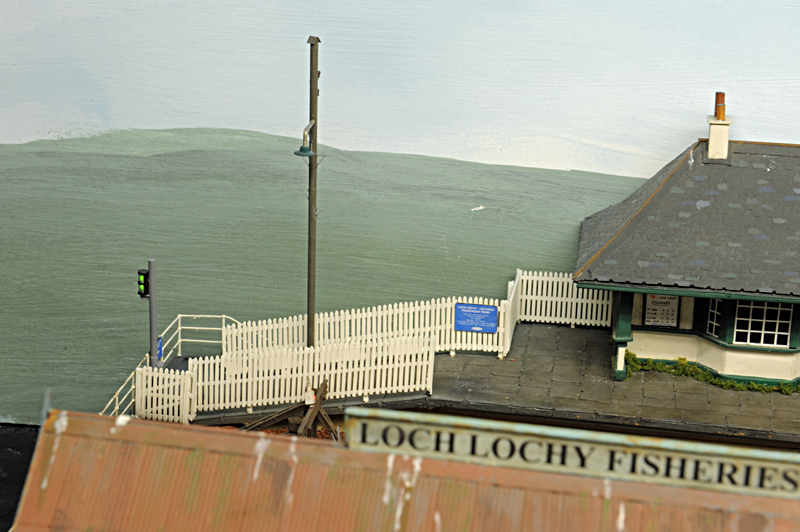 After being on this forum for a while I thought it was about time I showed some pictures of my 7mm layout Loch Lochy. First of all some history - the 1889 proposal to build the West Highland Line into Fort William included a short branch from Spean Bridge to a lochside pier on Loch Lochy in the Great Glen. Eventually the branch was removed from the plan to calm fears by the Highland Railway however several years later an ill fated branch line was built from Spean Bridge to Fort Augustus and you can still walk part of the long dismantled line, however there was never a pier and station on the loch. The original plans are available on the national archives for Scotland website and interestingly the original proposal doesn't quite follow the same line as the Fort Augustus branch but was actually on the south side of the river Spean for most of its route. I overlaid the plan onto a modern OS map and was able to place exactly where the pier would have been. 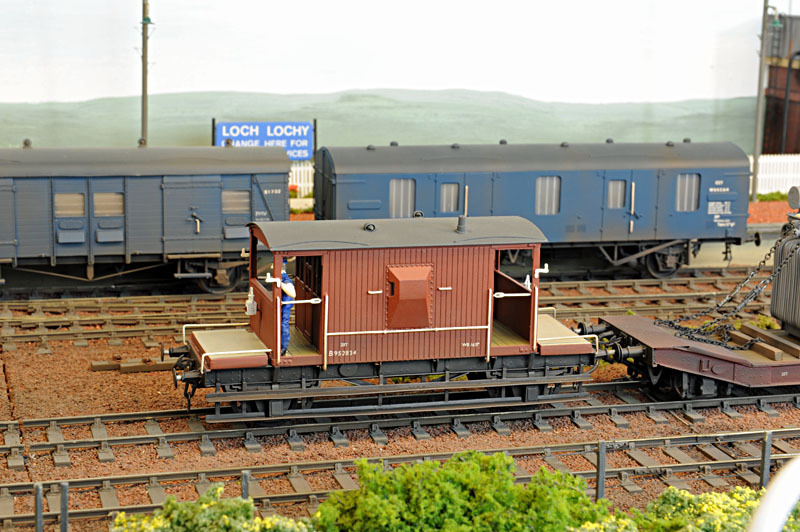 The original Loch Lochy layout was built by Ian Futers but when I acquired it a couple of years ago there were a few things that I thought could be improved - the width was only 18" in places, track covered most of the boards leaving little room for scenery and there was no room for the other end of the run around - it was assumed to be off stage. Therefore I set about completely rebuilding it with longer, wider baseboards, handbuilt C&L track, and the missing loop, whilst retaining Ian's original concept, station buildings and fish processing factory. The line is set in the late 1970s, early 80s and it's assumed that local CalMac steamer services call at the pier to enable through trips to Inverness, somehow the fishing industry is still using the local processing factory, and there is another local industry off stage which allows me to run a variety of rolling stock. This is the typical WHL chalet style station building as built by Ian but with additional features by myself. The fish processing factory is in the foreground with the loch to the left. The steps to the steamer services are at the end of the pier. The navigation lights are scratchbuilt with parts from a model boat supplier and a small electronic circuit to make them prototypically fade on and off. A close up of the fish factory showing everyone hard at work. 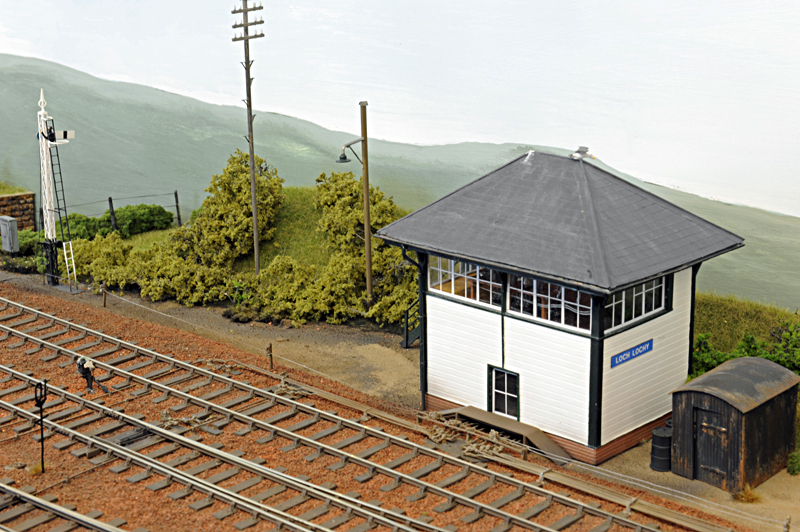 The signal box at the east side of the station is scratchbuilt out of plasticard but based on the one at Glenfinnan. 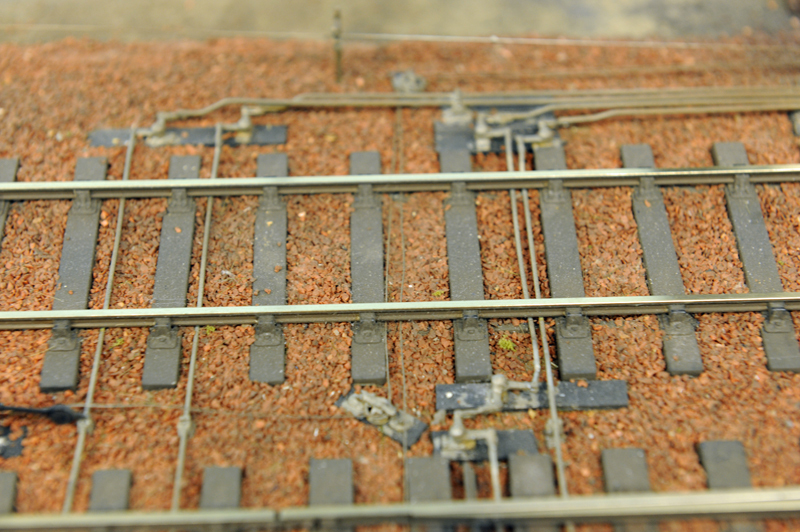 This shot shows the point rodding and signal wires, and the typical red ballast used on the WHL. 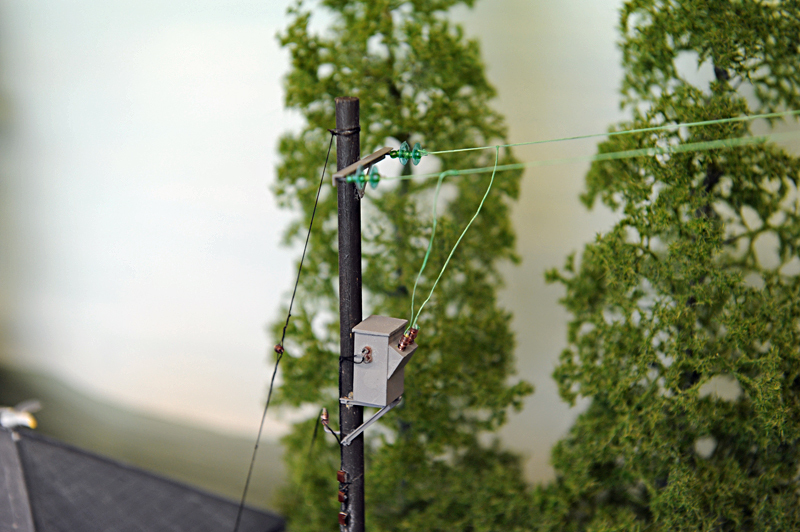 There are some trees to plant behind this part of the line before I can connect up the telephone wires. The backscene is a temporary painted one until I can get up to the west coast again to actually take some photos. 08718 takes some fish vans out of Loch Lochy. The water tower still exists but the NBR crane has gone. In twenty years time they will have to reinstate it for the tourist steam specials. This view shows the stream coming from the hills into the loch which actually exists. 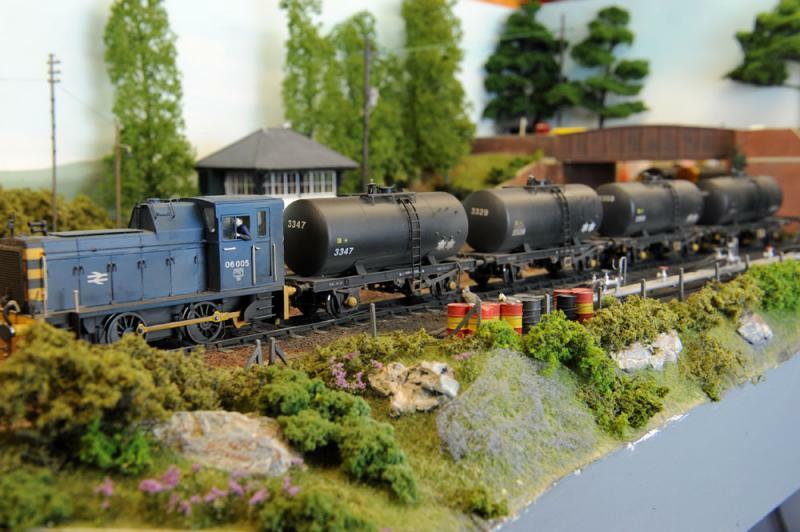 Some TTAs waiting to be unloaded in the oil siding. These are from JLTRT and are very nice. I've always been interested in electronics so despite the layout being small I chose to use Railroad & Co for control and interlocking of the signals and points. I don't currently automate anything but I might in the future. 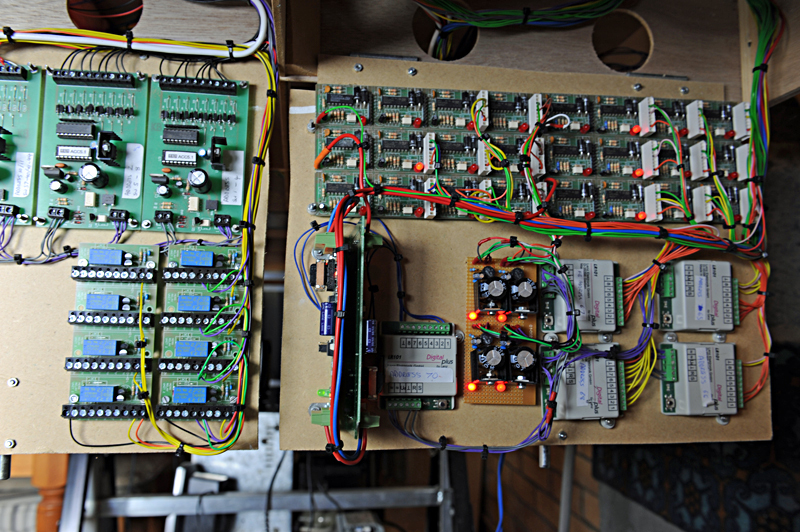 The photo below shows a couple of circuit board panels under the layout hinged down for access. They contain the block occupancy detectors, power supplies, feedback encoders, PSX modules, accessory decoders and relay boards. There is still a lot more work to do, especially around detailing and weathering, plus I don't have much rolling stock as yet so I've been building lots of kits and there isn't much ready to run in 7mm scale. If anyones interested I can show some more photos. Brilliant, Julian. More photos will be great. Nice pictures. Couple there for my jigsaws. Thanks Julian. A superb introductory set of photos, thank you. We perhaps don't see enough of 7mm simply because many of us don't feel we can afford the space it might require. 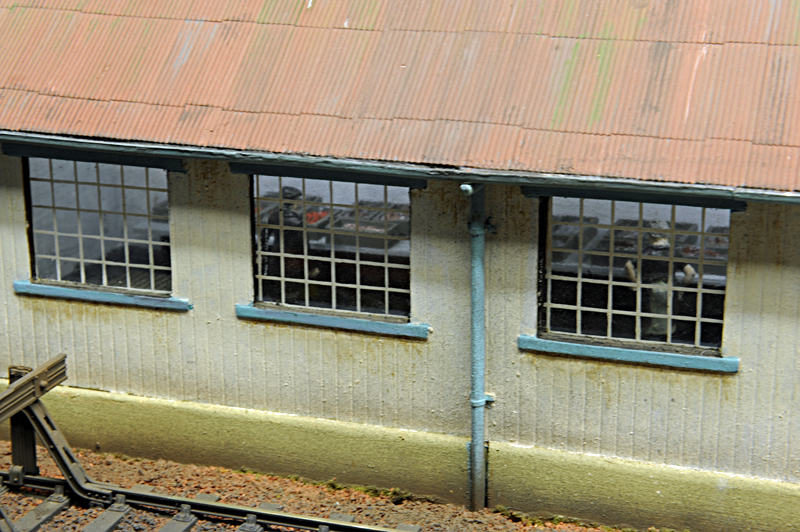 What you show proves that a large warehouse isn't needed in order to have a superb layout well presented and also that a huge amount of detail can be shown in this scale which adds to the realism and is often not possible in the smaller scales. You have captured the look and feel of Scotland very well. And those who mind don't matter. I looked at that first picture and was immediately transported back through time to childhood holidays at Oban , Fort William and Rothsay where we stayed at the end of the pier and spent every day on the paddlesteamers doing various lochs and islands trips which always called at every pier. A superbly atmospheric layout , one of which I will not tire of seeing pictures and also quite appropriate in a week where one of the last Paddlesteamers to operate in UK waters - the ex Scottish lochs steamer THE WAVERLEY launches an appeal for £350000 needed to make up a shortfall in operating income caused by low passenger numbers due poor summer weather for a number of seasons. Richard. A sorely missed member who lost a brave battle in 2012. Straight man to the stars. Great pics and look forward to more. How much bigger is 7mm to oo by the way. phill wrote: Great pics and look forward to more. How much bigger is 7mm to oo by the way. It's just about double the size, Phil, 7mm represent 1ft instead of 4mm representing 1ft as they do in our OO models. 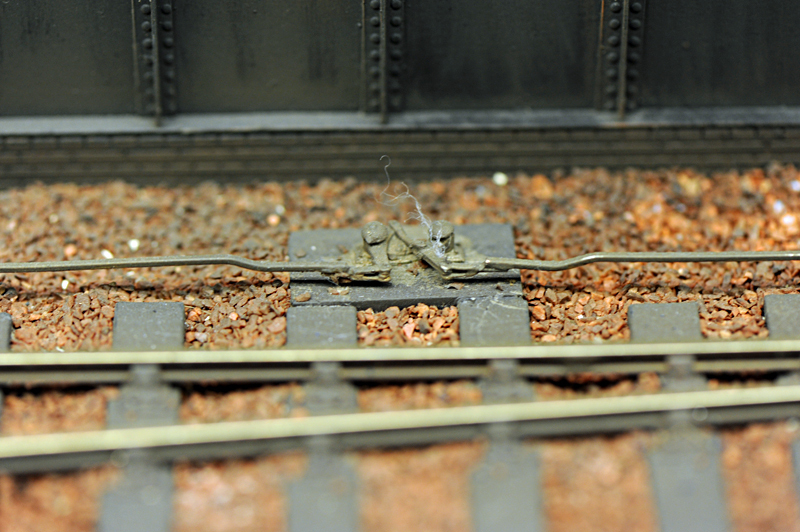 Very interesting work, very atmospheric, will be pleased to see some more, especially a closer-up shot of the point rodding outside the signal box. Thanks for your comments, chaps. It really means a lot to me and if it brings back memories of the area then I'm really chuffed. The west coast of Scotland is a beautiful place and it is most definitely atmospheric. Phill - although the scale is almost double OO, it means that everything is double in width, depth and height so the models seem much larger than 4mm. For example a Mk1 coach is 18" (460mm) long. I've only recently started modelling in 7mm but once you start there's no going back! Doug- I'll take some close ups of the point rodding tomorrow but here are some more that I've got to hand. 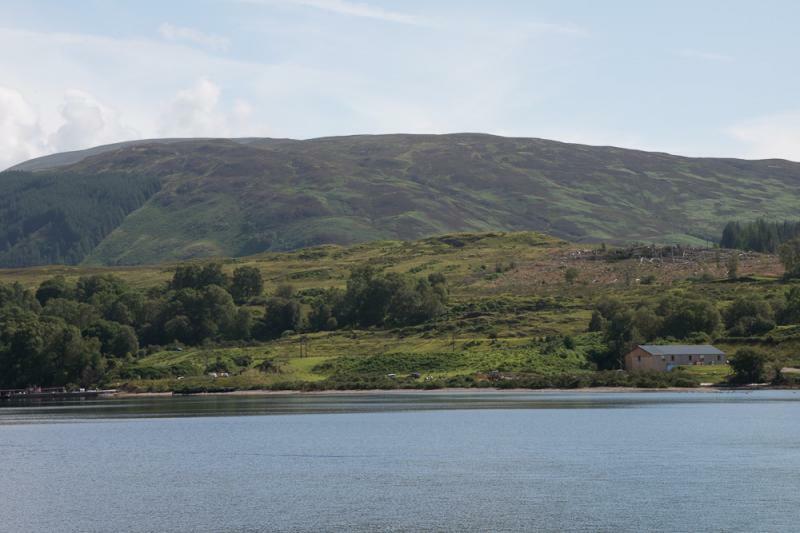 This is the pier with the slipway into the loch. The loch is freshwater so there's no seaweed or green tide marks but the water is cold, deep and peaty. Class 37 037 arrives bringing a couple of Mk1s. This is very typical of the WHL in the 70s and on a branch this size it might easily have been just one coach with a parcel (or even fish) van attached. Very handy for space starved 7mm modellers. This is a close up of a TTA which is still to be weathered. They were never this clean! The pipework is a mixture of what can be seen at Fort William and at Lairg - plus a dose of guesswork as it's difficult to get close up photos of oil installations. Skipping back a few years this is 06 005 shunting a 35T tank (and a worried guard). Finally a couple of night time shots. All my rolling stock and buildings have lights although I try not to over do it as there wasn't much public lighting about on the west coast in the 70s - still isn't in fact. 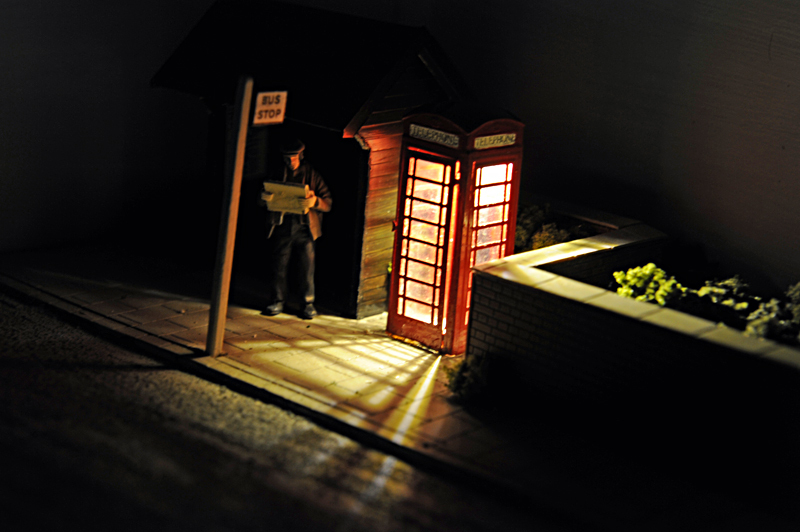 Here's a chap trying to read his paper by the light from the telephone box whilst waiting for the bus. 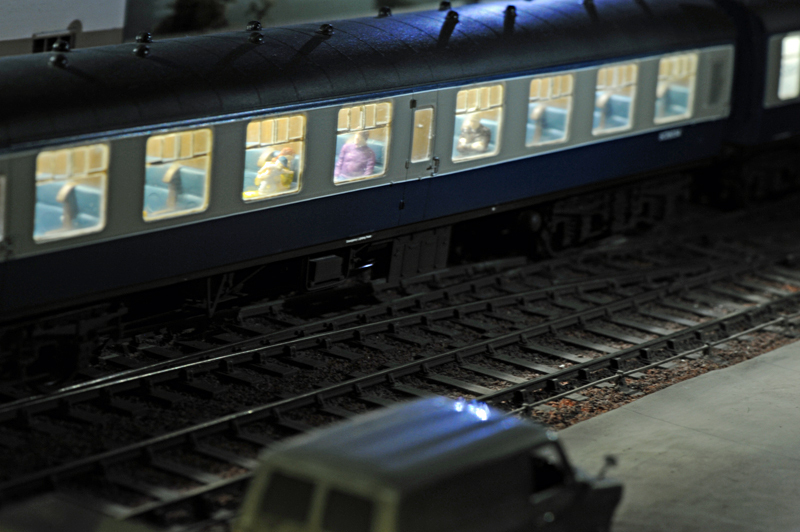 And passengers wait patiently for the last train of the day to depart. All is quiet in the yard until the next train arrives at first light. dooferdog wrote: phill wrote: Great pics and look forward to more. How much bigger is 7mm to oo by the way. Thats one thing I have never quite got my head round . When Cyril Freezer used to do his track plans in the Railway Modeller he always used to have them with a squares grid drawn with the track layout super imposed on it .It was stated that the layout if built to this design it should be assumed each square represented 6 x 6 inches in OOO scale (or N as we know it now) ie 2mm to 1 foot , 12 x 12 inches in OO Gauge ie 4mm to 1 foot and 24 x 24 inches in O scale ie 7mm to 1 foot. I understand doubling the area needed going from 2mm upto 4mm scale but did not and do not understand why going from 4mm to 7mm that the area needed would double again . To me it would make sense for it to double if you went from 4mm to 8mm but surely 7mm scale should need one and three quarters the space needed by 4mm scale ? Try putting it this way Richard. Doubling the size of an object which takes up space such as a building or railway carriage where its original size is "2" (2 of what doesn't matter). The length which was 2 becomes 2+2=4. The height also doubles 2+2=4 again. Then the depth of the object doubles so 2+2=4 yet again. The object has now been converted from 00 to O gauge but our brain perceives the increase to be very much larger because it hasn't just doubled in one dimension it has doubled in three dimensions. Superb new pictures as well Julian thank you. I do enjoy seeing trains with passengers in and realise the potential cost of adding even a few to just a small number of carriages may put that beyond the reach of some of us. The oil installation also looks very convincing. Imagine someone looking at a 36ft motor cruiser and deciding he wanted a 42ft model. Seems like all the dimensions want increasing by 1/6th, but would you need doors 1/6th wider? Or, deck heads [ceilings] another 1ft higher? Or, in the extreme, a a loo-seat another 4" wider? The cost doesn't become 1/6th dearer either, as it increase in volume by cube rules, so a lot more material is used. Sorry, Julian, off, topic, you can have your thread back now! Julian, I really do appreciate the opportunity that 'O' gauge offers and you've made the most of it. Nicely done and look forward to seeing more. As I remarked on another 'O' gauge thread, when I see pictures like this I wish I'd gone along that path years earlier when I had the chance. It's not just the size though, you get a much better sense of momentum and inertia with 7mm. I guess it's something that doesn't scale well. It all helps with the realism though - for me anyway. when I see pictures like this I wish I'd gone along that path years earlier when I had the chance. 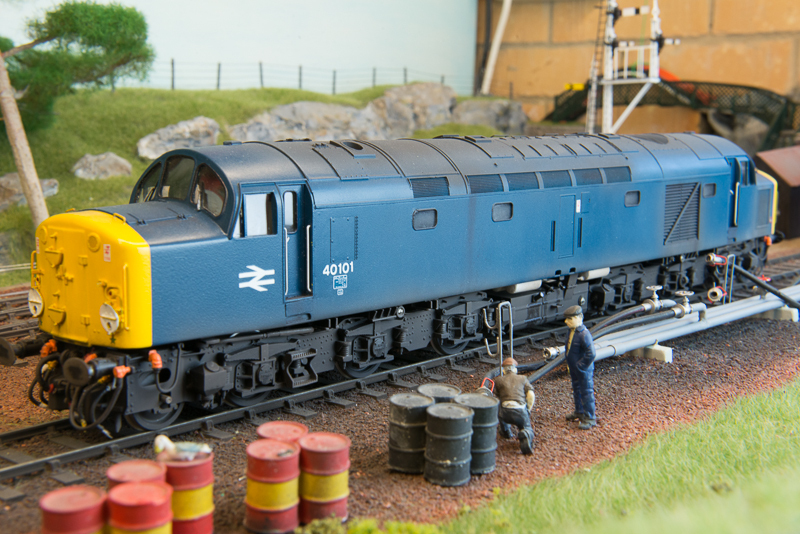 I was modelling in 4mm, off and on, for 45 years. I can't bear to part with my 4mm stock just yet though! Just for Doug here are some close ups of the point rodding and signal wires. This is the entrance to the signal box - I think I'm going to have to squeeze another signal wire in. It won't win any prizes but it's good enough from normal viewing distances. It's already won a prize, Julian. I hereby award it a Gold Star and an elephant stamp. I don't think I've ever seen the rodding modelled in that detail. But I've led a sheltered life. Superb Julian. I remember seeing Ian Futers original in the modelling press and always admired his work even though the layouts always seemed to me to have very limited operating potential. You've taken a layout with a good pedigree and sought to improve it and as far as I can see achieved your object with bells on. Excellent job. 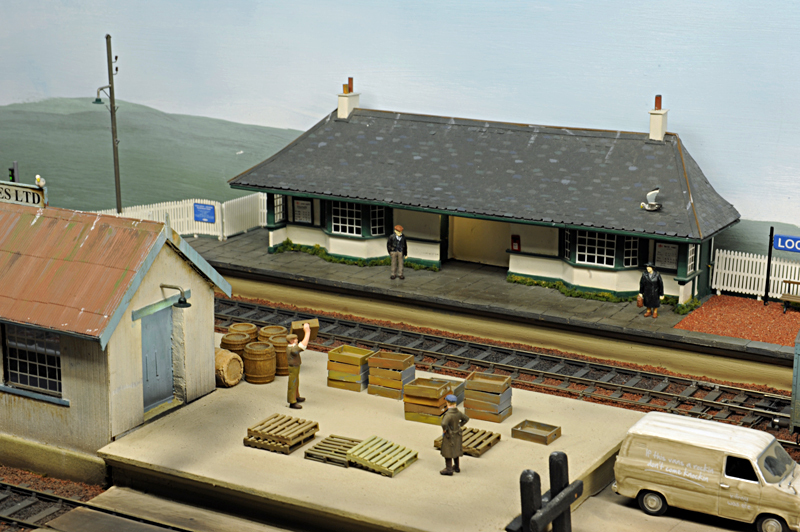 I love O gauge and it would be my modelling scale if only I'd had the space when I had to make the 'what scale do I model in?' decision. Can't wait to see it with the improved backscene. Personally I think it would look better without one for now. Superb detail on the point and signal linkage. Some of those parts including the baseplate where everything emerges from the 'box look to be kits. If so whose are they please? Max you are right in that it is uncommon to see such extensive detail so well modelled. 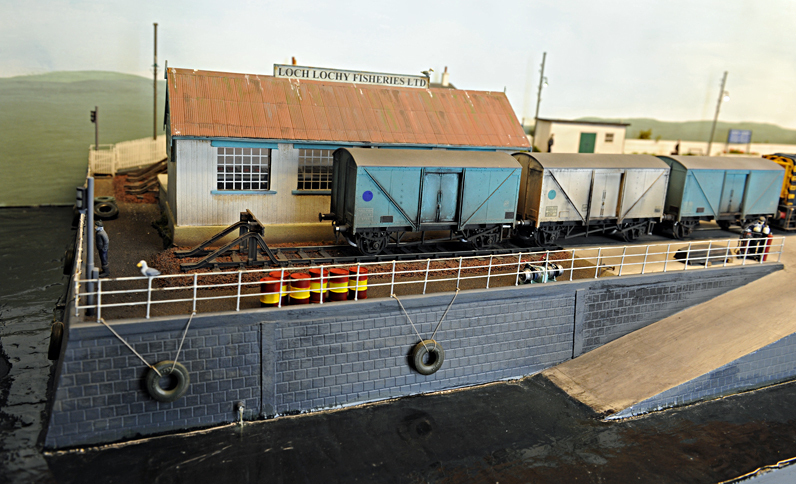 The only other layout I know of with so much intricate detail is "Llanbourne" owned by my friend Peter and shown on RM web. His is 00 with superb point and signal linkages. 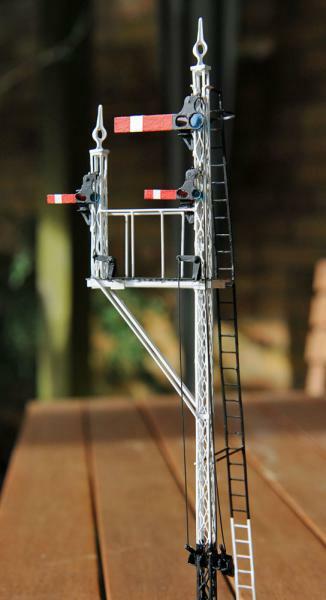 The point rodding is a combination of parts from C&L http://www.finescale.org.uk/ and Model Signal Engineering http://www.wizardmodels.co.uk/. The rods themselves are 0.9mm square wire which I found on eBay. Unfortunately I couldn't find any which was not coiled so it had to be straightened before use. On the prototype this is usually inverted U channels and is attached to the cranks via a rod mounted within. I couldn't think of an easy and robust way to do this so compromised by soldering the rod directly to the crank. If I think of a better way of doing it then I will. Julian, had a quick look at the site - impresive, now to have a good read about it. That Clagg green Street is surely an impressive place with top flight modelling. Julian, I appreciate the encouragement, but these days time is not exactly on my side for such a momentous change. I'm content enough with what I have, and have achieved, and will vicariously enjoy your and others 'O' gauge ventures. 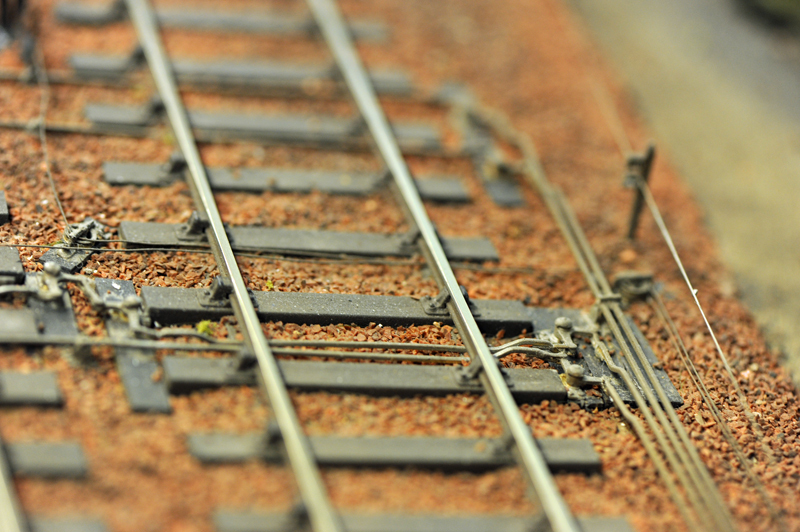 One of the aspects of modelling I enjoy most is adding all those little details. 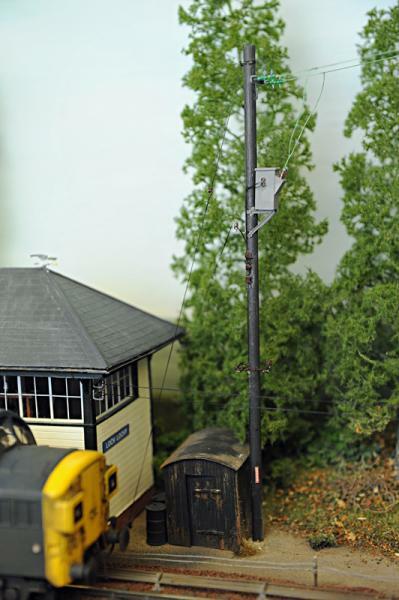 I was adding some telephone wires to the signal box and realised that a box in that location would in all probability have power fed from an overhead cable via a transformer on a pole. This meant a bit of scratchbuilding! 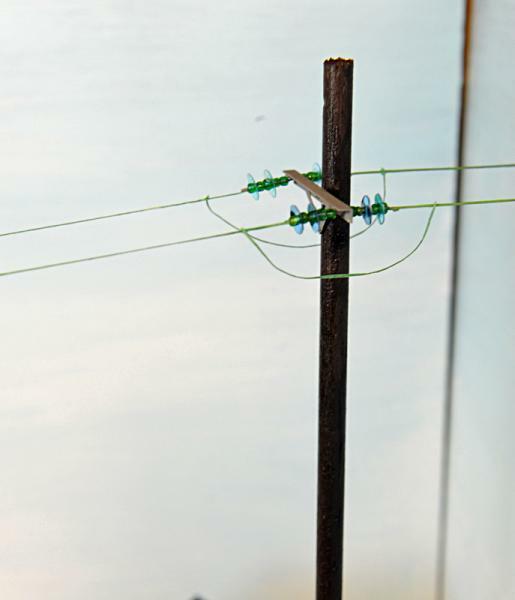 The transformer is knocked up from plasticard while the supports attaching it to the post and the cross bar are L section brass strip with 0.7mm wire rivets. The barbed wire anti climb protection is just very fine single strand wire with twisted barbs, painted a rusty colour. The junction boxes are all scraps of plasticard whilst the wires are EZ line which is great stuff. The 11kv high voltage wires cross over the road which means another pole. The insulators are just rochaille beads and sequins. If you get the right colour then there is no need to paint them and they have a natural opacity which resembles the real thing rather well. They are just the right size for 7mm but I think they'd be overscale for 4mm. It looks really good Julian and is one of those additions that add so much, even though small in itself. Love it. 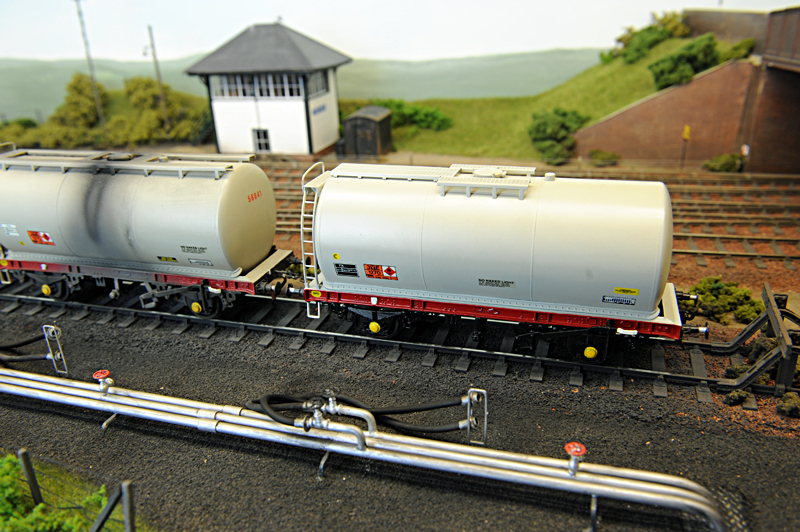 You may remember I'd previously posted about building an MMP tank wagon - http://yourmodelrailway.net/view_topic.php?id=7057&forum_id=62&jump_to=129505#p129505 - well I think I'm a bit addicted to them. I've now finished four and they are just about complete although they could benefit from a little more weathering. Next up is a dogfish but that looks a bit easier (and quicker) to build. Great photographs Julian with plenty of atmosphere. How I love 7mm scale. 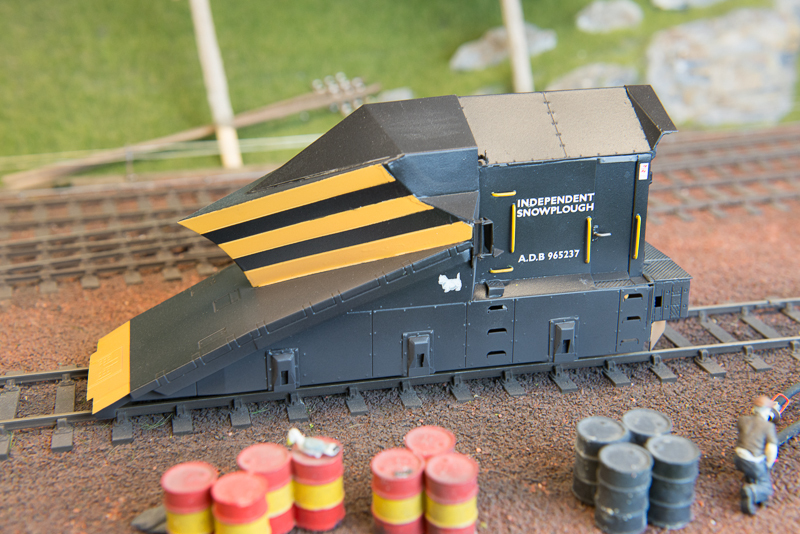 Hi Andy, the oil was simply weathered black railmatch paint, heavily diluted, and sprayed using an air brush. I started with a wide light spray then brought the airbrush in closer to represent the thickest concentrated spill in the centre. I think it's because it was so diluted that it gave that slight sheen to the thickest part in the centre. Love the layout. Great idea to model the Highlands in O. A 9 coach train would bankrupt most folk! The detail very impressive too. The rodding and wires look just right. Julian, you have made great improvements to a great layout. I love the detail and atmoshere. A lot of interest in a small space (for O scale). A great inspiration for me. 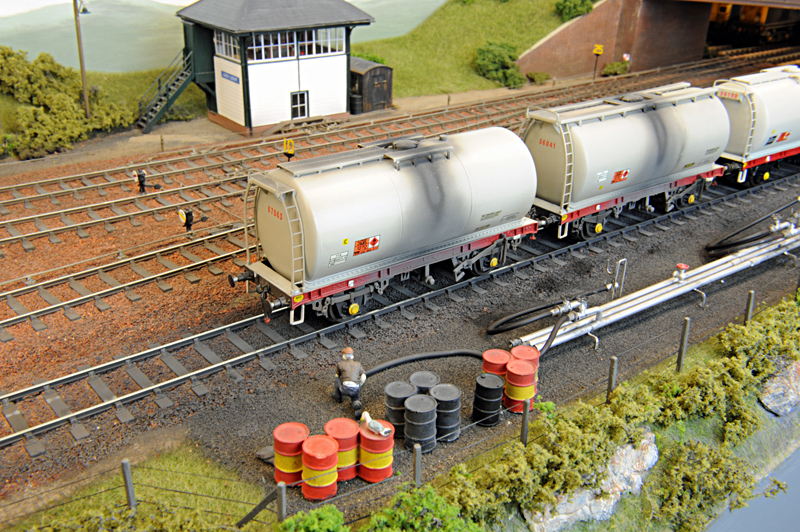 When somtimes in the future I have better eyesight and more skills I am tempted to try to copy it in 00 scale as I will never be skilled enough to do it in O scale. Thanks for your comments, guys, they are very much appreciated. However I keep trying to improve parts I either rushed or are not happy with in light of further experience so it's very much an ongoing project. I'd really like to extend into the garden to give the locos a decent run but so far negotiations with SWMBO have not been successful. I'm going to post some more photos of a couple of other wagons I've recently built but I want to finish the weathering first. It's been too cold in the garage over the last couple of weeks to get the airbrush out but hopefully I will be able to soon. I've just started on a JLTRT Class 27, which is just about essential for a WHL railway in the 70s, so I'm really looking forward to getting that running. I'll try and take some shots of the build over the weekend. 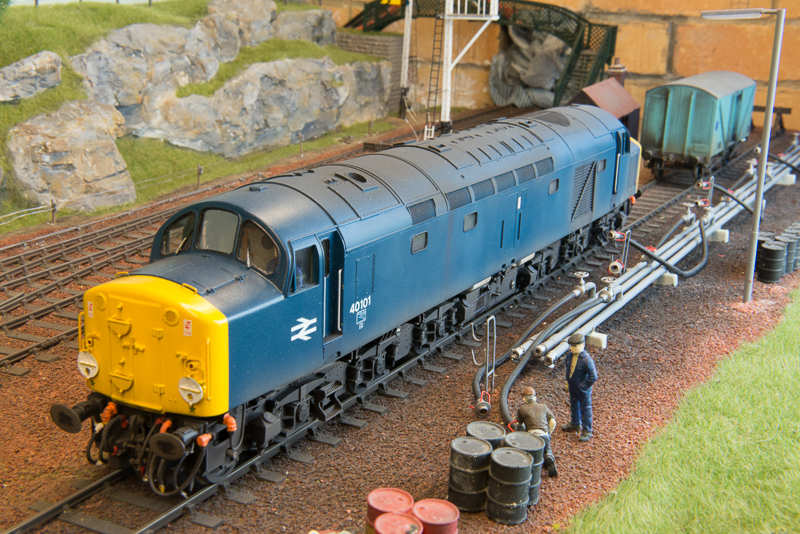 Well it's taken a bit longer than anticipated to get it finished but the Class 27 is done. A class 27 is essential for a West Highland Line railway in the 1970s but in 7mm there aren't many choices. I've been waiting for ages for David Parkin to bring out his kit but eventually I couldn't wait any longer, took the plunge, and went with the rather expensive JLTRT option. It's a good build although rather tricky in places and it took me a couple of months to get everything how I wanted. It uses Roxey gearboxes and Mashima motors with Slaters wheels and a Howes Loksound 3.5XL decoder. As I was throwing all the bells and whistles at this loco - I don't plan to build another one anytime soon - I also added a Peter Clark smoke unit . I've heard lots of pros and cons over the use of smoke and how it doesn't scale well but the benefit of this unit is that it has a powerful fan. The heater and fan can all be controlled via DCC and I suspect I could even synchronise the whole start up sequence using Railroad and Co but I'm happy controlling it manually at the moment. Forgot to say that I also fitted MMP snow ploughs. The detail on these is just incredible. There 10 individual parts just connecting the centre plough to the buffer beam which have to be soldered together without destroying the detail. The only clean 27 I've ever seen in photos was in the shed when having a refit so a little weathering was called for with the airbrush. And here's the smoke unit in action. This shot hasn't been photoshopped, it's just as it was taken although in reality the smoke is a little denser than in the photo. I've also been meainng to post this CCT which I finished over Christmas - seems a long while ago now! 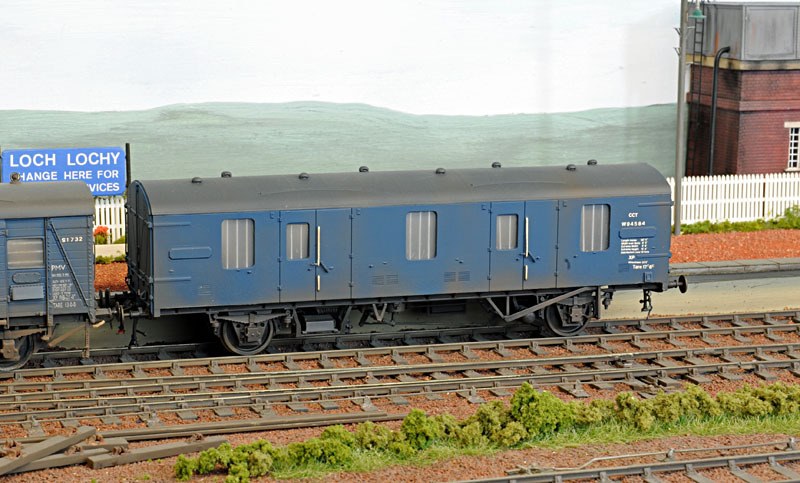 Next up is a Connoisseur models BR 20 ton brake van. I bought this brass kit at the Southwold exhibition last year and it's a real joy to make with very clear instructions and an easy to build design. The kit only took a weekend to solder together. And finally a lowmac wagon from On The Wagon kits. 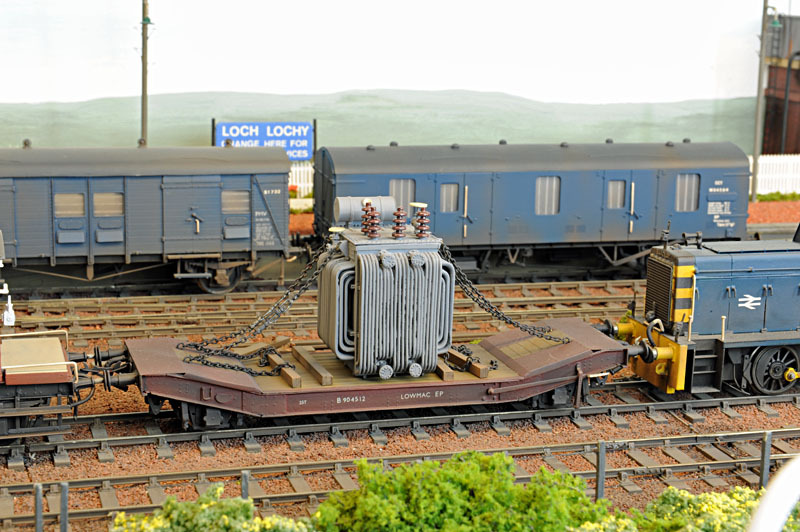 The transformer, no doubt destined for the latest hydro electric scheme, is a Peter Duncan kit and just fits in the loading gauge. It also adds a bit of weight to the wagon and is an interesting and unusual occasional train. Excellent, Julian. Well worth all that work. Some really brilliant models there. That smoke unit looks just right - a little "haze" and the shimmer of heat again the greenery behind - wonderful stuff. 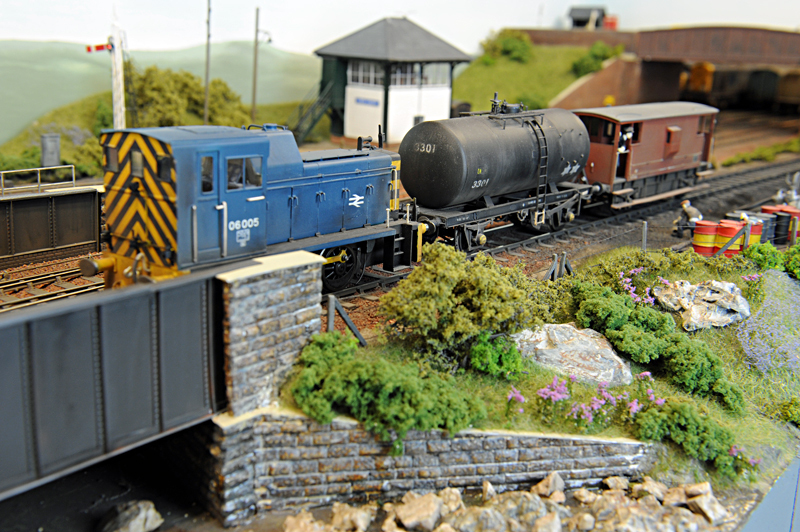 What a lovely looking layout, great detail too. Just shows the advantage of 7mm. I especially like the fuel terminal. Very good! This means that I can extend another 5 feet to the Spean Bridge side of the road bridge. Therefore I can move the run around loop crossover to the correct position and have another goods siding. It will also mean that the troublesome traverser will go and I'll replace the fiddle yard with a combination of sidings and a cassette system. So what would be the first thing you'd do in this situation? Maybe start on a baseboard, build some trackwork or do some full size mock ups? Well I built a signal! I love signals and the extension will allow me to add another. 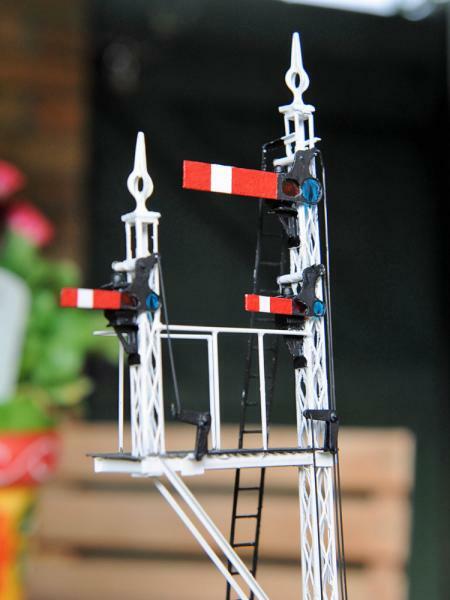 This will be a home signal with an auxiliary signal for the goods yard and a calling on signal for the platform. 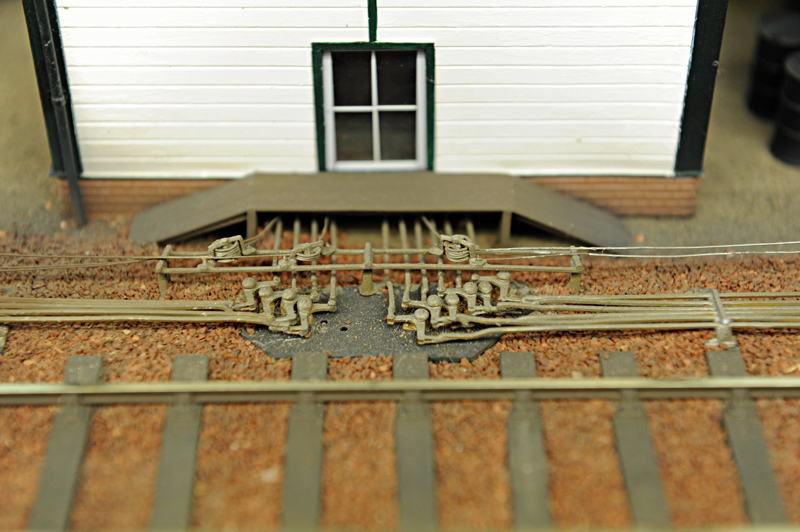 Most of the signals on the West Highland Line were Stevens lattice posts so I ordered some parts from MSE and work began. 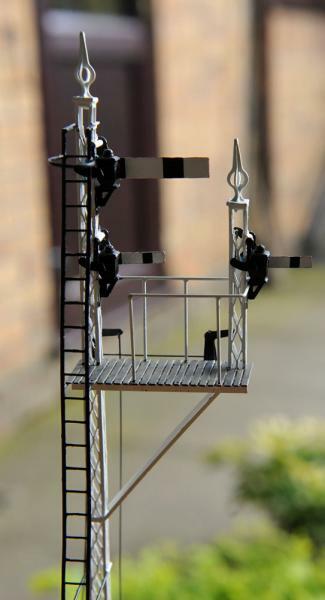 The ladder came from Scale Signal Supplies as my skills are not up to building the MSE ones, although they are better. All the supporting braces and brackets came from the spares box whilst the lamps have warm white LEDs in them for illumination at night. I'll use my usual MERG servos for operation - when I can get them to work properly. I think I'm suffering from PIC version problems. I've downloaded yet another version of the code to see if I can get that to work correctly. Next week I'll start on the new point work and trap at the end of the run around. I will love the extension! Can you please give thanks to the domestic authorities for the Permission for a small extension to the railway? 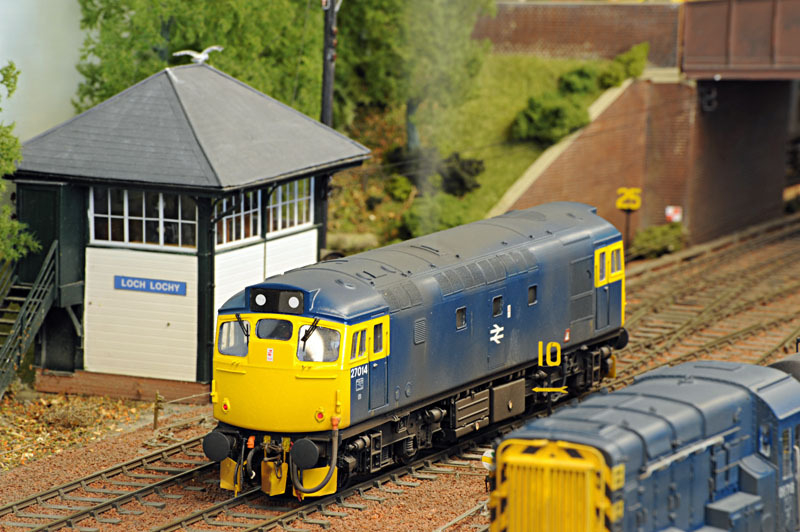 Great looking signals Julian and the larger scale makes a huge difference to the detailing. The MSE models certainly look crisp and strong. glenng wrote: Can you please give thanks to the domestic authorities for the Permission for a small extension to the railway? Negotiations took a while but a very successful significant birthday party for the authorities led to the application being passed. I've got one of those sitting on the shelf unbuilt from my 4mm days! The MSE ones are brass and are a real pleasure to build. Easy to unsolder and change if necessary - you just need to be careful that the lattice post is straight and square. I'm glad you like the layout - I don't really have a track plan so I've grabbed the Railroad & Co screenshot to give you an idea. The extension is progressing and this reflects the new track. 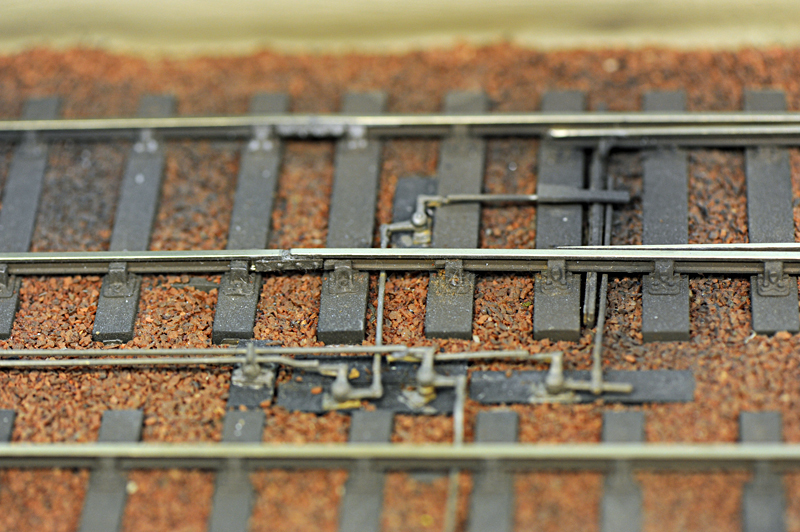 The fiddle yard is off the plan at the far right whilst the oil siding is going to move from the bottom right siding to the one above it which is slightly longer. The old oil siding will become a loading bay. I think this should work better and be slightly more prototypical. I'll try and upload some new photos of the work in progress towards the end of the week. Sounds good. I am looking forward to seeing some more photos. 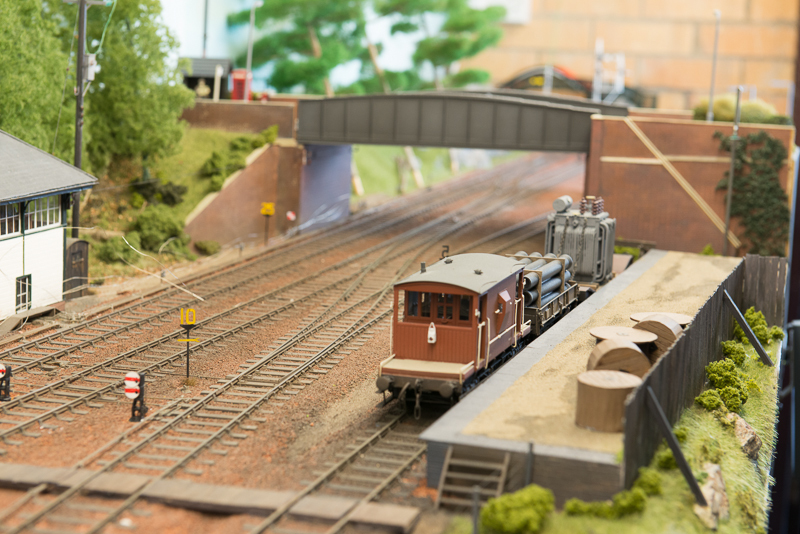 I love seeing a good O Gauge layout and this is most certainly a good one. The amount of extra detail that can be modelled add so much to the realism though I suppose this can be a double-edged sword since unless it it is done well it can ruin the whole illusion. In this case, however, the detailing is of the highest standard so I must express my thanks to Julian for showing Loch Lochy to us. Many thanks for your kind comments and I'm so glad you like the railway. Apologies for the delay in replying but I've been away on holiday on the west coast of Scotland. Whilst travelling around we took the opportunity to visit Loch Lochy so for those of you who are unfamiliar with the area around the Great Glen here's a snapshot I took last week from the pepper pot lighthouse on the west side. The boats have just left the lock gates and canal after ascending Neptunes' Staircase. The weather was glorious the whole 10 days we were there with the exception of wednesday when we took the Jacobite steam train to Mallaig - thoroughly recommended as one of the great railway journeys of the world. Anyway a while ago I found the original plans for the line on the National Archive of Scotland website and overlaid the plan onto the modern day OS map. I can't post the map here as it's not my copyright but I was able to determine where the station and pier would have been. The large shed on the shoreline below is approximately where I think it would have been. Whilst I was there I also took several panoramic shots which I hope to stitch together to provide a new backscene. Unfortunately the weather was so glorious I fear it may not look too prototypical! Nice, Julian. We've just finished watching Three Men do Scotland. Beautiful scenery! 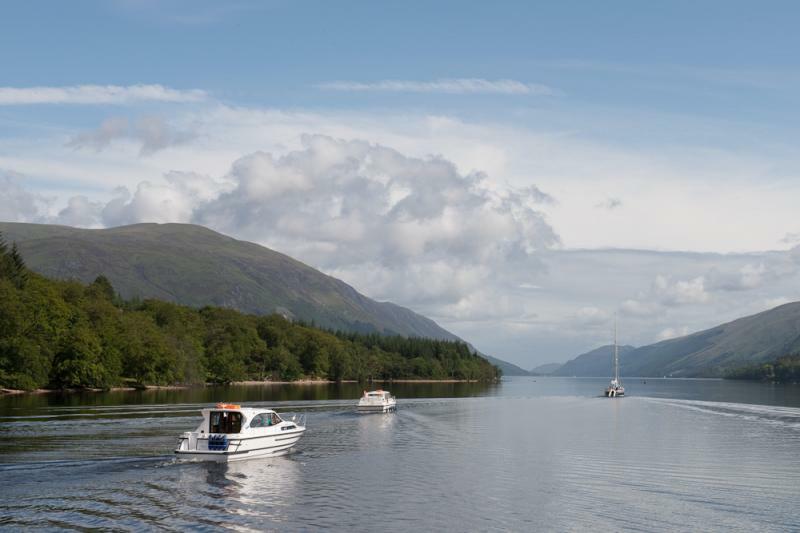 Loch Lochy looks fantastic. I model in OO but the level of detail you can go to in O is seriously tempting me. I came across YMR Club whilst searching on Google images for Glenfinnan, so have only just joined, but have a question that i hope you can help me with. At the moment, i am building a small West Highland terminus in OO along similar lines. I have built a model of a signal box, based on Glenfinnan, using a Ratio Midland box kit as the donor, but very heavily modified. It is largely complete, but still need to do the soffit brackets, downpipes and staircase. i am having difficulty however with the colour scheme. I am not keen on the yellow/duck egg blue that Glenfinnan was painted in until its latest refurbishment. Could you tell me what colours you have used. are they purely matt black and white, or have you used an off white? In one of the photos it looks like the black may have a greenish tinge, but that is probably just my eyesight! Could you also tell me what colour grey was used on the roof. Thanks for your kind comments. The signal box is actually a shade of dark green, very close to the station building, which was in use on the WHL at the time. Not sure why it's come out so dark on the photos. The white is out of the can white but it's had a very light dusting of sleeper grime which has toned it down slightly. It would probably have been better if I'd used a slightly more off white colour but too late now! The roof was just a blend of white and black acrylic to get the right sort of shade for slate but I did also dry brush it with both lighter and darker shades to give it some variation. Not forgetting the seagull poo on the apex! I really must post some photos of the extension as it's coming along and there have been quite a few changes compared to the photos in this thread. I will give these shades a try, and depending how it comes out, may post a picture! Absolutely stunning layout with fantastic detail. I hope the spoken extension has come to fruition, as I would like to see more ! The spoken extension has indeed come to fruition although progress has been somewhat slower than I'd have liked. The main reason is that it's just been too cold in the garage over the long winter that the UK has experienced this year. I've kept myself busy building rolling stock though. 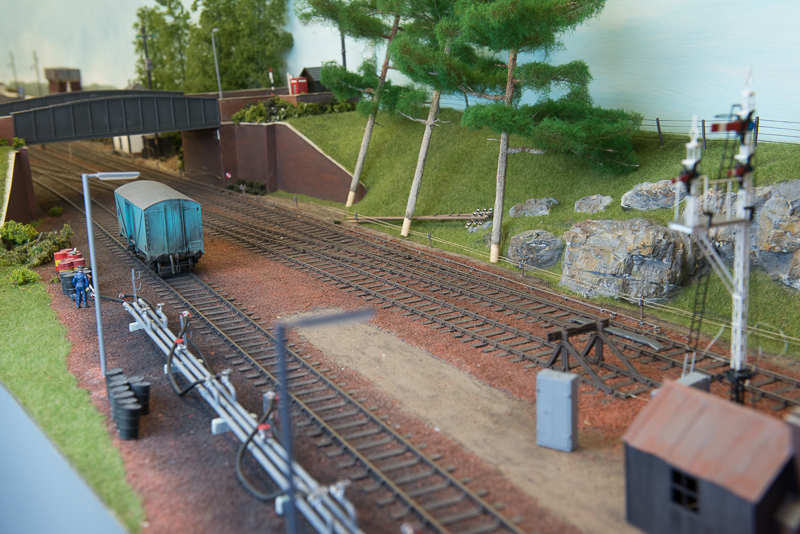 In the meantime here is a small progress report on the work done on the Loch Lochy extension last summer/autumn. The end of the release crossover which was between the bridge and the signal box has been moved to the other side of the bridge which is operationally much better. 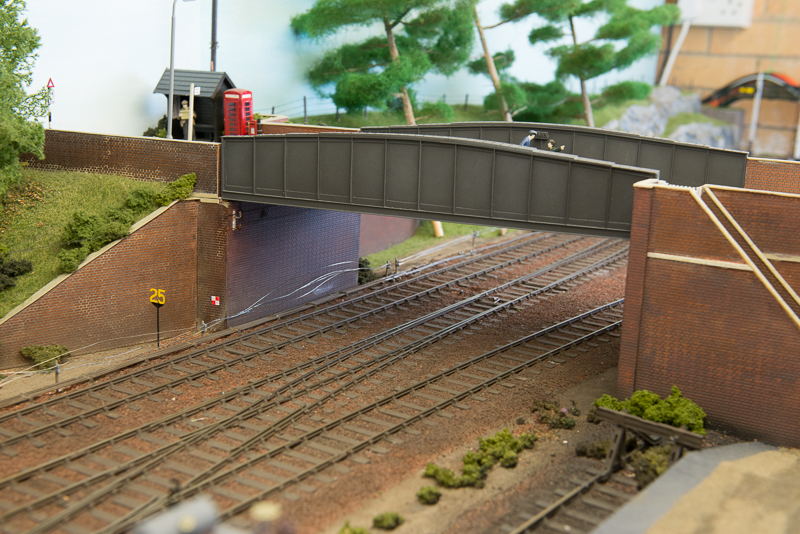 However to get a smooth flow of track I've had to widen the bridge which meant rebuilding it completely. Worth doing though as I know I would never have been satisfied otherwise. This is the new oil siding the other side of the bridge on the new extension. It's longer than the previous one and following my trip to Fort William last summer when I took lots of photos of the real thing I'm also happier with the pipework. As you can see there is still masses to be done; security fencing adding, all the embankment scenery and loads of other details. 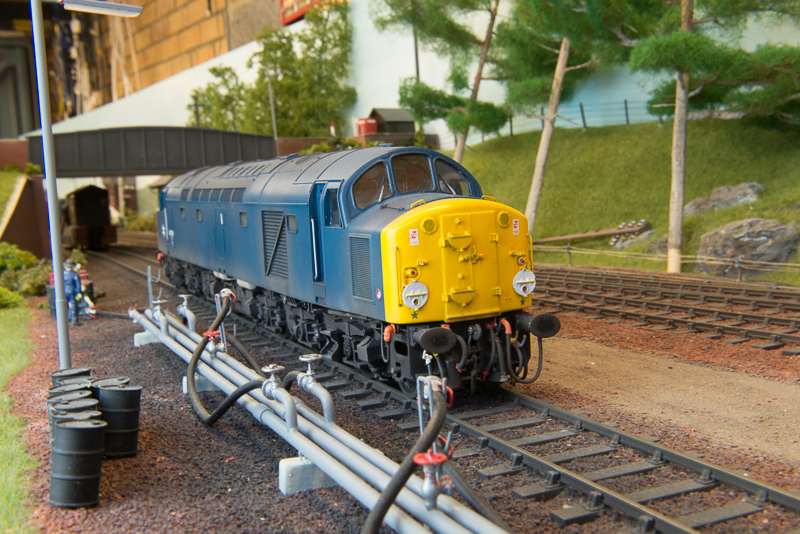 I was pleased with the 'fluorescent' 70s style lights which were scratchbuilt from brass and surface mount LEDs. I'll post a picture of them working later. Building the new pointwork has also left me dissatisfied with some of the original pointwork. I know I can do better so replacing some of the older ones is next on my job list. However I haven't been idle these last few months - here are some new items of rolling stock. First of all I build two PRMRP independent snow plough units which I picked up at the Telford show last September. These are nice brass kits which just need soldering together although I did have to buy a larger iron to join the upright part of the plough to the body! Here's one of them. Still needs a bit of weathering. I was up the West Coast again in February and literally stumbled over a snow plough in the siding at Glenfinnan. I took loads of photos but it would have been much better if I'd been able to do this before I built the model! Then I built a JLTRT Class 40. 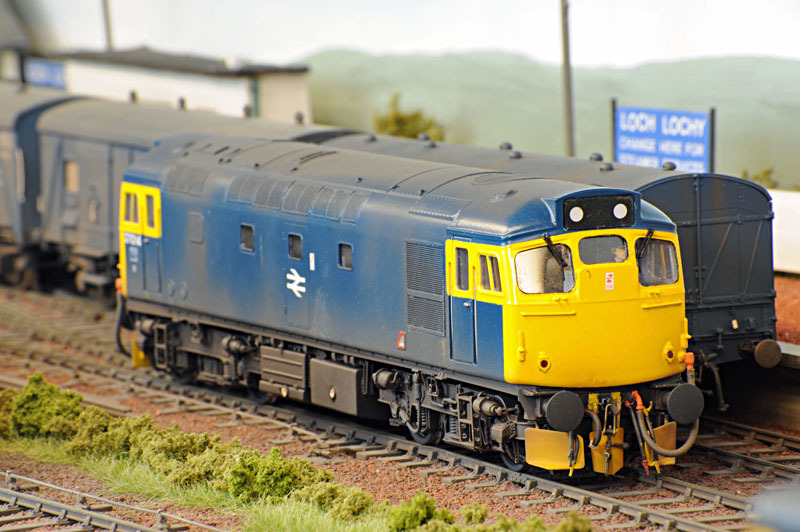 Now although class 40s were heavily used in Scotland none made it up the WHL until recently. However I grew up in East Anglia and regularly watched them on the GE main line. Therefore modellers license was exercised! I'm currently finishing off an MMP class 08 which, as is always the case with MMP, has astonishing levels of detail and consequently takes an astonishing amount of time to build. It's currently in the paintshops so I'll post some pictures when it comes out. 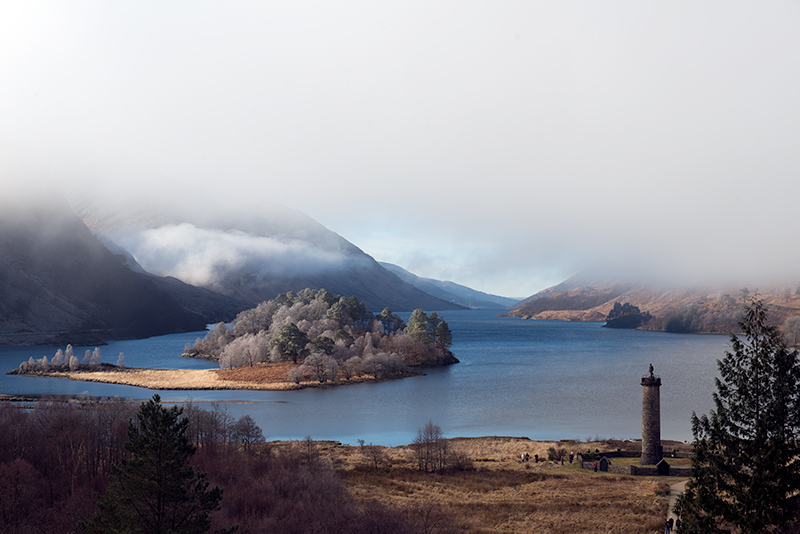 Thought I should post these pictures of Glenfinnan that I took in February. I've never been up the West Coast in the winter before and I was blessed with just stunning weather - the hills looked magnificent with snow on the top and the blue seas and skies - I'll definitely be going again. This shows the monument from the view point. The sun was just beginning to burn off the mist whilst the frost was still heavy on the trees. Turning around 180 degrees provided this view of the viaduct. 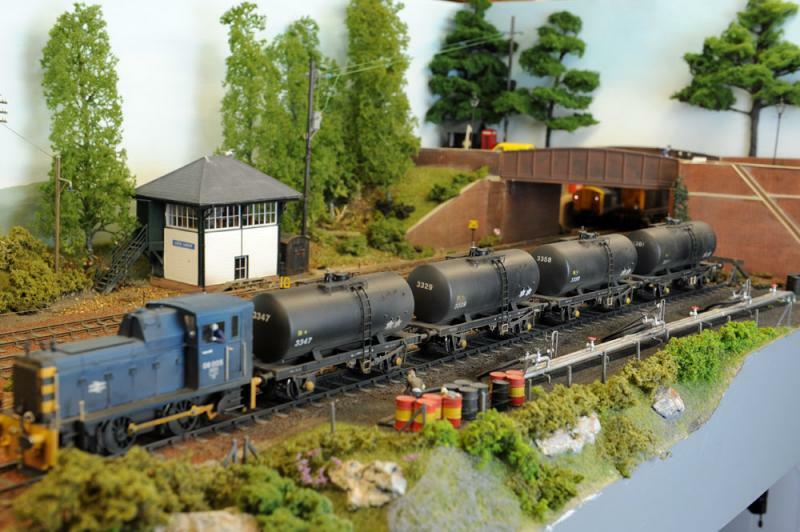 The more photos I see of your layout the more tempting O gauge seems. 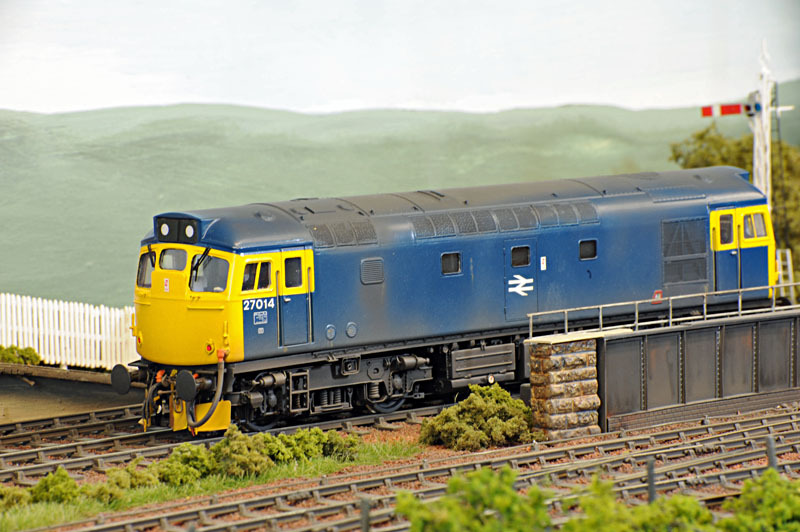 If I ever come back to modelling the British rail scene I think I will go O gauge. However in the past I considered it easier for the eyesight than OO gauge and thought it could help with my poor eyesight and even poorer modelling skills but taken full advantage of the bigger scale now seems more difficult after having seen what quality can be achieved. Thanks for the update, some great pics of the layout. Those rocky outcrops opposite the oil sidings look fantastic, great colour. Very nice Class 40 ! You certainly have kept yourself busy during those cold wintery months ! 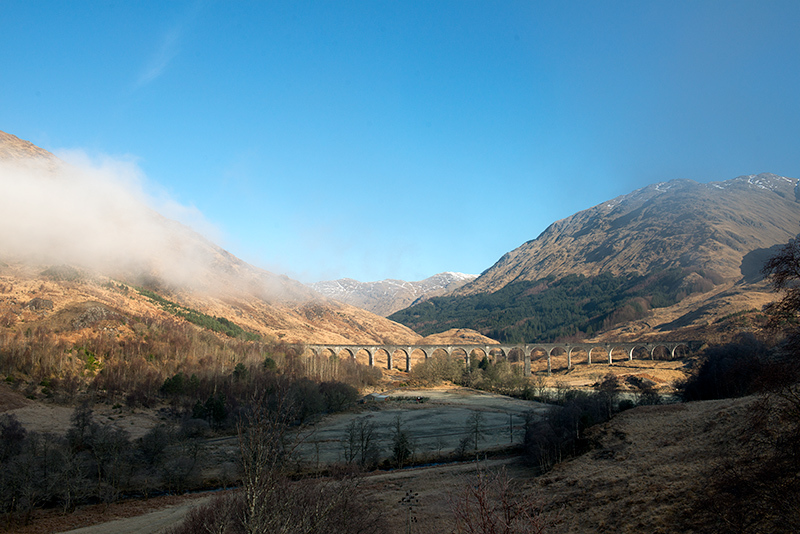 The pic of the viaduct at Glenfinnan is something else, very impressive. I had to have a look at it on google maps and I was intrigued by the massive bend in the bridge, it has got to curve atleast 100* from one end to the other ! I was also amazed by the size of the lake (opps, loch!). Great work Julian. Fantastic layout. What is the memorial in one of the photos of the loch? col.stephens wrote: What is the memorial in one of the photos of the loch? It's a memorial to an anonymous highlander. See http://www.undiscoveredscotland.co.uk/glenfinnan/monument/ for the full story. You can climb up the monument but it's quite steep and narrow - at the top you have to pull yourself up through a sort of trap door. I've got a picture of SWMBO carrying out this manoeuvre so I'll see if she'll let me post it. Pretty belatedly, a lovely layout with so much detail. I really like the track work.